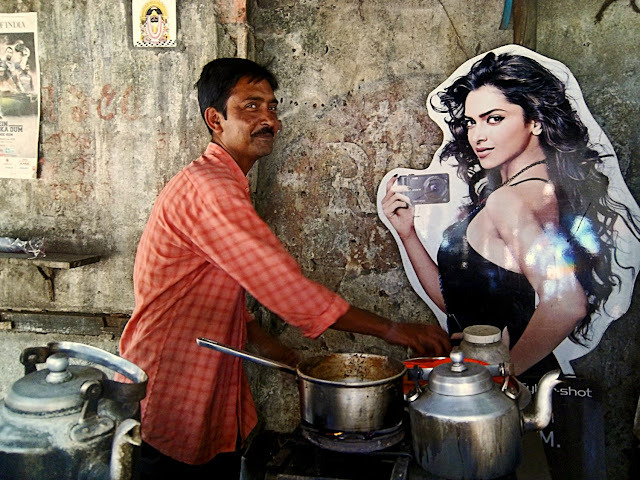 This photograph shows a poster of Deepika Padukone stuck on a wall inside in a small make-shift dhaba in Kolkata. The cook is making some tea or chai, in an aluminium pan but what keeps him in a good mood is Deepika smiling down at him! This poster is a cut-out of an advertisement. Deepika appears to be advertising a Sony Camera. On the unpainted and rough wall behind the chai shop owner is a calender (to the far left of the photo) and a photograph of the goddess Durga just behind his head.